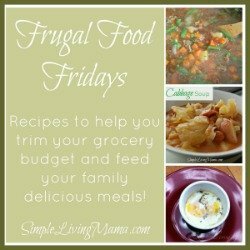 Frugal Food Friday is back! 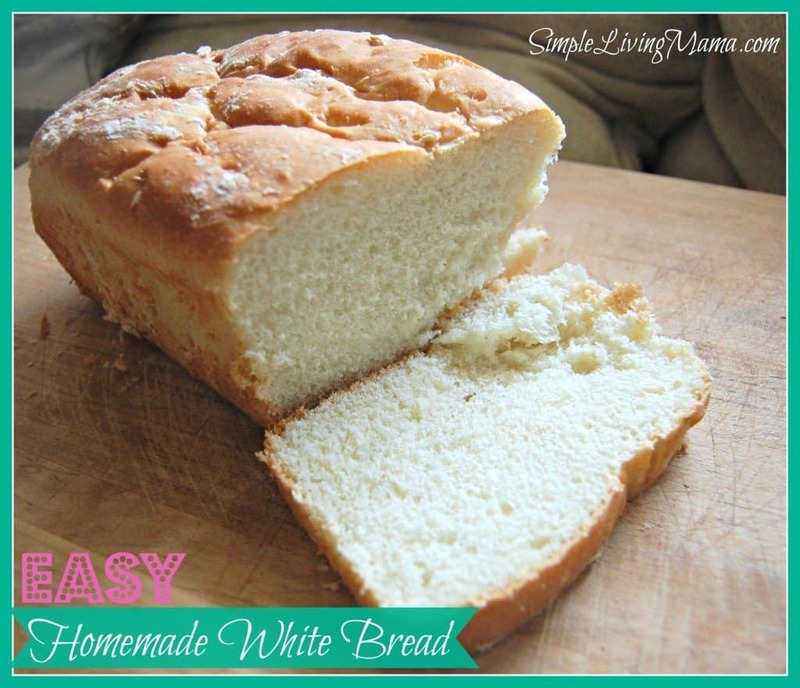 Today I am sharing a simple, easy recipe for homemade white bread. My kids come running every time I pull this out of the oven. The aroma wafts throughout the house and makes our mouths water. This recipe is a simple staple. The bread is slightly sweet and accompanies dinner perfectly. Add this to your list of simple living recipes. You can substitute whole wheat flour for white flour in this recipe. You really just have to play around with it. I have found my family really does not enjoy whole wheat, so I usually just use white bread flour. I specifically buy King Arthur’s bread flour. It is the best I have found. I buy Fleischmann’s Yeast in jars and keep them in the fridge. All of the other ingredients are staples you should have in your pantry. Bread-making takes some practice, but once you get it down it’s not so hard. I use a Kitchenaid mixer with a dough hook to do the most of my kneading. I used to use a breadmaker. I simply let it mix up the dough and do its first rise. Then I transferred the dough to loaf pans and baked in the oven. I like bread baked in an oven better than the breadmaker. A slightly sweet white bread. In a mixing bowl, combine warm water, sugar and yeast. Allow yeast to proof. It will foam. Mix salt and oil into yeast mixture. Using a mixer with a dough hook, add one cup of flour at a time. Continue mixing on low to medium speed until dough is smooth. If dough is too wet, add a little more flour. Cover bowl with a damp cloth and allow to rise until doubled. Usually 1 hour. Turn dough onto flour surface and divide in half. Knead for a few minutes and shape into loaves. Place each loaf into a well-oiled loaf pan. Allow bread to rise for 30 minutes. It should rise about 1 inch above loaf pan. Hi, Joanie! Is there a wheat replacement for bread flour? Thank you! You could just use whole wheat flour, but the texture will be different. I have yet to make a loaf of 100% whole wheat bread that we are all happy with, but I have not been trying much lately. Whole wheat makes a much denser, heartier loaf. My plan is to use part bread flour, part white whole wheat flour and slowly transition to whole wheat. King Arthur flour makes the white whole wheat which is not quite as dense as the other whole wheat flour. I absolutely love all of their flours! We’ve made our own bread on and off for years. Upon moving this Oct, and discovering that the cost of bread in this area averages about $3 a loaf, it’s back to bread making! We use just regular all purpose flour, and it turns out fantastic. Also, we don’t have a mixer w/a dough hook, but we *do* have a teenage girl. (I had to give up making bread myself when, due to a work injury, developed RSD in my dominant hand and arm. Can’t knead bread one handed!). If you don’t have a dough hook, kneading for 10 mins works too.